Keeping chips off your Y-axis leadscrew from Tim Schroeder - Millhill Supplies Ltd. The X and Z leadscrews on a Sherline mill are positioned so that they are protected from flying chips. The Y-axis screw, however, is exposed. 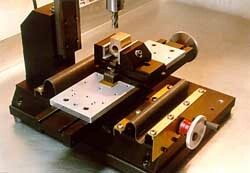 On a manual mill, the operator is in constant attendance and can simply brush the chips away periodically, but CNC operations often run unattended for periods of time, and the volume of chips produced with a CNC system can make finding a way to keep them off the Y-axis screw a higher priority. Tim Schroeder came up with a pretty good solution for his manual machine by using some old rubber inner tube material which is held in place with brass angle that attaches to the mill base and front of the saddle. A second piece is located behind the table and is secured to the front of the mill column base. The above photo is pretty much self-explanatory as to how it works. The addition of these parts may mean a slight reduction in your Y-axis travel, but in most cases the extreme ends of your travel envelope are not used anyway.